This week's theme over at I Heart Cooking Clubs is "Chocolate Cravings." Oh yes, I have chocolate cravings. Often. But, I have to admit, it was hard for me to find a chocolate Giada recipe that was crave-worthy. So many of hers are combined with espresso, and, while I can tolerate it sometimes, I am not a coffee fan. So, I finally settled on this one chocolate recipe that I had bookmarked back when I had cable and would watch Giada's show almost every day. I wanted to save it for the holiday season, but I guess testing it out beforehand is a good idea. 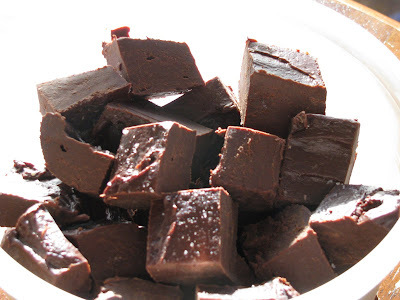 I made the Cinnamon-Chocolate Fudge recipe, which is available on Food Network's website. It's easy to make. Very easy to make. Dangerously easy to make. Why is it dangerous? Because this stuff is GOOD! I would venture to say that the sea salt is NOT optional. It completely takes this fudge and elevates it to something special, something out of the ordinary, and something totally addictive. Sweet from the chocolate and sweetened condensed milk, warming from the cinnamon, and salty from the sea salt. The flavors all pop in your mouth, and before you know it, you're reaching for a second piece. My advice: Cut them in very very small squares so you won't feel so bad about going back for more. Be sure to hop over to I Heart Cooking Clubs to see what other folks made for their chocolate craving week. Butter the bottom and sides of an 8 by 8-inch baking pan. Line the pan with a sheet of parchment paper, about 14-inches long and 7-inches wide, allowing the excess to overhang the sides. Set aside. cinnamon, and vanilla. Stir in the chocolate chips and butter. Put the bowl on a saucepan of barely simmering water and mix until the chocolate chips have melted and the mixture is smooth, about 6 to 8 minutes (mixture will be thick). Using a spatula, scrape the mixture into the prepared pan and smooth the top. Sprinkle with salt, if desired. Refrigerate for at least 2 hours until firm. Remove the fudge to a cutting board. Peel off the parchment paper and cut the fudge into 1-inch pieces. Store refrigerated in an airtight container or freeze. Cinnamon and chocolate are so good together. I imagine the salt does add another level. Will have to give this a try...and will follow your advice about portion size! This looks and sounds great - I love the idea of the cinnamon with chocolate. You are right a lot of Giada's chocolate recipes seem to be combined with espresso - a combo that I love personally - but I imagine that you could replace the espresso with cinnamon in just about any one of them if that's a flavour combination that is more to your liking. With Christmas coming up I will definitely be making up some batches of this for gifts, along with some of her chocolate balsamic truffles. I thought about making this recipe too! I love the combination of cinnamon and chocolate and will definitely take your advice about cutting it into small pieces when I do make it. It looks delicious - great choice! Ohh this looks divine! Love the cinnamon chocolate combo. I would love to join cookbook lovers unite. Thanks! At the moment I am traveling and will not be in my own kitchen for another month or so. But I will hop on the train somewhere down the line! OK...you have me convinced! This looks perfect and I am always for anything where sea salt and chocolate are combined. Great pick! I absolutely love the thought of cinnamon and chocolate together. This fudge does sound dangerous. It should come with a warning. I love sea salt with chocolate. Such a great contrast! Mmm, love that sea salt and chocolate combo - great choice! I love the cinnamon and chocolate combination and of course, there is never anything bad about fudge :) Glad to have found your blog! Oh goodness, this would be absolute heaven for me! Love the cinnamon in there.